“Happiness can be really simple” was the theme of The Second Let It Shine Graduation Concert which was successfully held at S.K.H. Chu Oi Primary School (Lei Muk Shue) on May 3, 2016. Despite the small scale of the concert, it meant a lot to students, teachers and audience alike: it was a performance that they will remember for a long time. Over the past eight months, members of the Hong Kong Virtuoso Chorus volunteered their time every week at S.K.H. Chu Oi Primary School (Lei Muk Shue) and Shamshuipo Kaifong Welfare Association Primary School to teach students to sing and speak English. 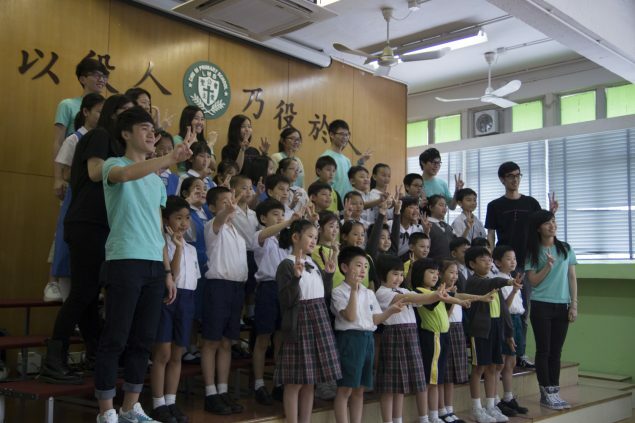 Most students did not have any previous musical training, and it was a great challenge for them to learn not only sight-singing and basic singing techniques, but also to tackle singing in English! In the concert, students took turns performing what they learned during the academic year. Seeing them stand on stage confidently and sing happily was such a thrill to the audience and especially their teachers who were really proud of them and their hard work. Apart from singing techniques, we hope the students have learned that the key to happiness is to share love with people around them. The Hong Kong Virtuoso Chorus would like to express our heartfelt gratitude to the following parties for their kind support towards The Second Let It Shine Music Training Project: St. Paul’s College’s current Form 5 Students, S.K.H. Chu Oi Primary School (Lei Muk Shue) and Shamshuipo Kaifong Welfare Association Primary School.